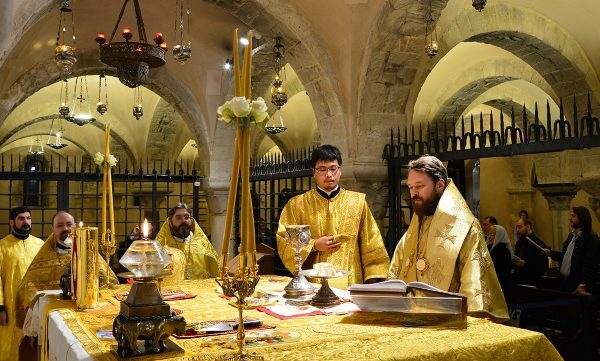 On 13 December 2016, commemoration day of the Holy Apostle Andrew the First-Called, Metropolitan Hilarion of Volokolamsk, chairman of the Moscow Patriarchate’s Department for External Church Relations, while in Italy on a working visit, celebrated the Divine Liturgy in Bari in the crypt of the Basilica of St Nicholas the Wonderworker, on the altar above the relics of the saint. Concelebrating with the archpastor were archpriest Andrei Boitsov, rector of the Russian Orthodox Church’s Metochion in Bari; Rev. Alexy Dikarev, DECR staff member; Hieromonk Zotik (Gayevsky), a cleric of St Nicholas Metochion in Sofia; archpriest Peter Kholodny (Russian Orthodox Church Abroad); and Hierodeacon Nikolai (Ono), a postgraduate student of Ss Cyril and Methodius Theological Institute of Postgraduate Studies. At the conclusion of the service the archpastor delivered a homily, greeting the worshippers with the commemoration day of the Holy Apostle Andrew the First-Called, whose name is traditionally associated with the preaching of the Gospel in the territory of the historical Rus’. By God’s grace, the Divine Liturgy was celebrated that day at the relics of St Nicholas the Wonderworker, the most venerated saint in the Russian Church. As Metropolitan Hilarion noted, St Nicholas, venerated by Christians of various Churches and even by the followers of other religions, unites the West and the East, coming to the aid of all those who turn to him in their sincere and ardent prayer. The same day later Metropolitan Hilarion of Volokolamsk visited the Metochion of the Russian Orthodox Church in Bari and congratulated archpriest Andrei Boitsov on his name day, wishing him God’s help in his work.